We all know the old English idiom, “don’t judge a book by its cover”. As true as that might be, whether or not the writer was actually talking books here, that’s exactly the first thing I judge a book by. Unless it’s the work of an author I know and love, the initial thing that draws me to pick up a book from the shelf, is the cover. Then I’ll turn to the back and the blurb. I’m willing to bet that’s the case with most readers. I’ve spent the last few days agonizing over cover images. I had about seventy stock images that I need to use up within the next month as I’m cancelling my subscription with one of my stock photo suppliers—I simply can’t get through all the images I get. The result of this was that I had to plan out my entire Under the Sun collection…ten years’ worth of work if I write three books per year for this collection. Although I should have spent the time writing and editing, it was good that I was forced to take time out to do this. It was in searching for relevant cover images that I realized the need to split the collection into series. I now have ten series planned in this collection. 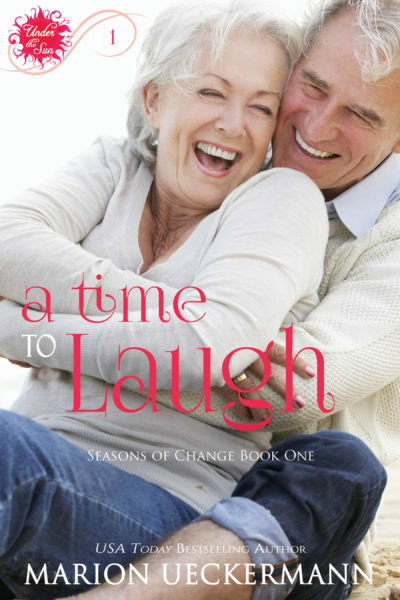 A Time to Laugh that released this past Monday in the Love at First Laugh box set is Book One in the first three-book series, Seasons of Change. Other series I plan to write in this collection that are: Seasons of Acceptance, Seasons of Charity, Seasons of Courage, Seasons of Perseverance, Seasons of Contentment, Seasons of Faith, Seasons of Trust, Seasons of Hope, and Seasons of Grace. I also spent time this week agonizing over other covers. You see, on Friday I accidentally deleted some folders from my main Under the Sun collection folder. I managed to recover some files with recovery software, but it seems that my Photoshop files were not able to be retrieved. So I had to recreate A Time to Laugh’s front cover, back cover, and the full cover for print. What a schlepp! But, I’ve finally managed to get myself back to square one where this particular book is concerned and I’m ready to go to print as soon as 25th March rolls by…the date we’ve set for solo print releases. But there was a further reason I suddenly felt like a cover queen this weekend. There’s an upcoming Scottish Highlander sweepstakes taking place later this month. Although I have a swoon-worthy Highlander hero in A Husband for Holly, I was concerned that my cover didn’t say Highlander. It didn’t even say Scotland. But when I put the good Reverend Stewart onto the front cover, for me, it just didn’t work. My great plan was nothing more than an epic fail. Still the same book, but in my opinion, not nearly as appealing as the original cover, and yet, the Scotsman in a kilt worked for the back cover. So how was I to bring Scotland, or a Scottish hero, to readers’ first impression of this book? In the end, it was so simple. I merely changed the blue banner at the top, into a tartan banner. Not just any tartan, mind you—Royal Stewart tartan, because it’s the plaid of my hero’s clan, as is the kilt the hero’s wearing on the back cover. Oh, and before you go, do share with us what attracts you to a book, or what your favorite kind of cover is. Pulling the quilt tighter, she strode off between the trees to cross the field behind her house, headed straight for the church. The drone of the bagpipes grew louder with each step. One small mercy to this morning—it wasn’t raining. Already halfway across the field, Holly turned to see Heather waving as she ran toward her, draped in a quilt, as well. She paused to wait for her sister. The man carried on playing. Was he ignoring her, or could he not hear above the blare of the pipes? His eyelids flew open to reveal pale cornflower-blue circles. As his cheeks deflated, a gorgeous dimple formed on either side of his face, just above his strong, smooth jawline…with its cleft chin. Too much attention to detail. This wasn’t a room interior she was scrutinizing. “Mornin’.” He rolled his ‘r’. His smile weakened Holly’s knees and her resolve died a slow, miserable death like the bagpipe emptying of air. Heather elbowed her in the side before smiling wide. “Hello. Top of the morning to you,” she greeted in her sweetest voice. With a smile he raked his fingers through the waves of neatly-cut, light brown hair before lowering his gaze to their quilts. Holly pulled her covering tighter. Sorry? Didnae know? Whichever road he’d taken, he would’ve seen the houses near the church. Unless he hadn’t driven from Robin Hood’s Bay. Whatever, those crystal pools of blue that held her gaze didn’t look at all sorry. In fact, they seemed to dance with mischief. She glanced away, and her gaze fluttered down like an autumn leaf falling from a tree as she took in his black double-breasted jacket and the white shirt peeking out beneath it. Then the intriguing Celtic-patterned belt hugging his hips. She stopped before she reached the white fur sporran in her peripheral view, and her eyes focused on the kilt he wore. She sucked in a breath. She knew that tartan. Holly held up the finger she’d jabbed him with, keeping her hand closer to her body than his. “J–just don’t do it again.” She pivoted then hurried back the way she’d come. Nice Blumes! The nerve. If he knows us, how can he stand there and blatantly tell us he ‘didnae know’ there were people living so close. Holly ignored his greeting. And his comment. Holly glanced down at her flowery boots peeking out of the quilt with each step and pressed a palm to her brow. Okay, so he didn’t know them. Still, he shouldn’t be out so early, waking the neighborhood. “I hadn’t noticed.” A lie she’d have to confess before taking communion this morning. “If there were, I wouldn’t know what it was, except maybe ridiculous.” Ugh, more confession. Would she even make it to the altar today? Holly picked up her pace, and Heather righted her direction to walk alongside her. She weaved her arm into Holly’s. “Nothing.” Holly glanced over her shoulder, past the gravestones dotting the distance between them and the lone piper. He still stood where they’d left him, his gaze fixed on their retreating forms. Like the ‘new’ cover and I loved a Husband for Holly:) Can’t wait for the next in the Sister’s series!! Congrats on the latest release. Thanks so much. Currently I’m working on Clover story and loving it. A Courtship for Clover will release early July. Should have been in April, but some scheduling changed, and this story moved to a different box set. With a holiday looming, I’m grateful for the extra time, though, but I am sorry to keep my readers waiting a little longer. Wow! The cover looks fabulous, Marion! I love it. Congratulations! Thanks, Jill. It’ll only be used on the promo, as it wouldn’t fit with the other covers in the series with it’s tartan banner. But, after trying so hard to bring Scotland into the cover, I was surprised at how simple it really was. Hopefully it’ll stand up in the sweepstakes against the other covers which undoubtedly will have bare-chested men in kilts LOL. 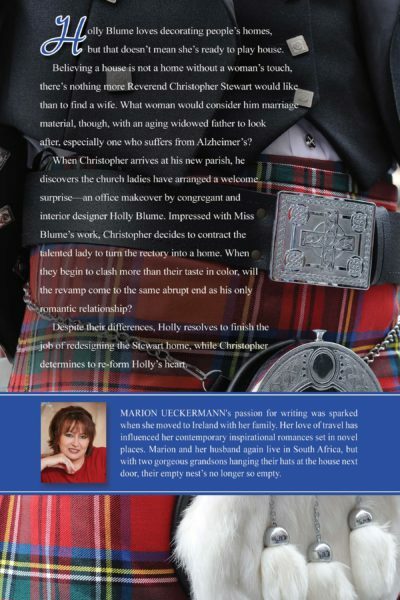 Love the new cover for inspiring romance A Husband for Holly. You have been one busy lady plotting out covers for 10 years. Looking forward to Under the Sun collection. I enjoyed reading A Time to Laugh. Looking forward to seeing what comes next. Best wishes and Happy Writing! I love the new cover and your energy. I look forward to all the new series. For me, I think it’s the colors that stop me in my tracks when I’m browsing a bookshelf. Blues, yellows and orange usually catch my eye for some reason. LOL, Jackie, circumstances kind of forced me into planning that far ahead, but it turns out it was a good thing. I usually do my cover first and then write. It’s a good incentive to get that story down on paper … even James Scott Bell advocates it in his book, Plot and Structure. I love these posts on covers and the thoughts behind them. I like color in a cover, something that draws my eye to it. I just noticed the previous two posts were also on covers. Totally unplanned. Funny, I tend to choose bold images and colors for my covers, and yet, when I see covers done in softer shades I wish they were mine :) Sigh. I love the look of the final cover! I also love the fact you added the Stewart tartan. My grandmother was a Stewart and I have a few things with the tartan plaid on them. I love reading stories of Scotland and one day I would love to go visit there. Thanks, Marilyn. My hero didn’t start off as a Stewart. It was actually that back cover that tipped the scales and the name change. However, I’m so glad it did, because everything just fell into place from there on. I’d actually originally chosen a surname for my hero that had a mauve and gray tartan. I’m drawn to color, characters or scenery on a cover. If it’s a couple and they look like they are having fun it makes me smile. Thanks for sharing what you love on a cover, Gail. Those of you who make your own covers amaze me. They look great. Thanks, Kimberly. I do love making covers…thankfully. Thanks, Margaret. Covers are definitely a matter of personal taste, too. Thanks, Merrillee. I’ve had fun creating the Blume sister covers. What’s been more of a feat than getting models who could pass off as siblings, has been trying to get the right suited man for the back cover. With my excess stock image problem, I searched for photos for the remaining 3 books–Clover, Poppy, and Lily’s stories. I’ve managed the first two, but the last one is proving a tiny bit problematic. But I’ll get there. Oooh, that makes me want to read more. I love stories that take place in Scotland. Me, too, Tammy. I have a great one set in Glasgow called Glasgow Grace, with a VERY swoonworthy hero. In fact, I was tempted to put that book into the Highlander sweepstakes, but I wanted to draw readers to my series, hence choosing A Husband for Holly. I really need to write more stories in Scotland…they’re such fun. Liz Curtis Higgs writes amazing historical novels set in Scotland. I love her writing. Planning covers sounds like it’s just as hard as writing the actual book. I love covers, and prefer them to relate to the story in some way. With or without people, as long as it has to do with the place or people in the story. I guess much like writing a book, some are difficult and some are easy. I always try to bring in a scene from the cover to the story, or have the hero or heroine wearing the same outfit as the cover (or both). Definitely, a cover must relate to the story. How interesting that such a seemingly small change can so easily bring to mind a different setting. Good luck in the contest! Oh my! Those are some plans! Though I often joke that I have enough story ideas jotted down to keep me busy for at least ten years. Love what you have planned! And the revised cover for Holly looks perfect! I love your book covers, Marion, my favorite being Poles Apart. Obviously I have to judge ebook covers by their visual effect on my laptop or tablet screen, but when I look at print books, the texture and feel of the cover is important to me. I live outside USA in South Africa. but I have also discovered that sometimes they are not my reflection on the story inside. I love the feel and smell of books also. Nothing like the touch and smell of paper, Rebecca. Unfortunately, my bookshelf overfloweth. Disappointing if a story doesn’t live up to the cover expectations. I really enjoyed reading A Husband for Holly. I loved how you solved the Scottish presence in the cover by adding Royal Stewart tartan. It reminded me of the scene in the Pastor’s office when they talk about fabric. As for book covers, I’m pretty much like you: if I know the author, I don’t really care about the cover. If I have to pick a new book, I’ll either have a recommendation (then I don’t care about the cover again) or I’ll pick something that looks sweet and inviting. I like seeing people and often enjoy a nice scenario behind them, specially if it is connected to the plot. Thanks for sharing what you like when choosing a book. How fun to play with your cover images! Love your covers! Your books sound so good, and I need to get some of them as I am an avid reader. I love your cover because. . . Scotland, tartan, kilts! It looks gorgeous and sounds wonderful! That’s a great cover! Oddly enough, I spent my whole day doing covers for two series and three individual books! Only one story is written at this point but doing the covers really helped establish a framework to build on. I’m new to this group and finding it oh so enjoyable! Thank you, Maureen. Welcome to Inspy Romance. So glad you’re having fun here. I really find that having a cover first helps me with writing my story. I’m married to a Scott with Scottish blood in his veins and a family tartan. I was piped down the aisle after we were married. Your book sounds delightful Marion! Nice, Dianne. I have a love for Scotland as it’s the country of my ancestors. My grandfather was a born and bred Scotsman, although he came to South Africa as a young boy of around 14 and stayed. I had fun writing Holly’s story. If I look back over the books I read last year it seems that I’m attracted to covers with people on them—even if it’s just a side profile. Great scenery or fabulous costumes go a long way too. Very few had illustrated covers (like Katherine Reay uses). Thanks for sharing, Amanda. Valerie Comer does great illustrated covers on a lot of her books. Thanks for letting us know your likes, Cynthia. I’m part Scottish, too :) And I love the country. Have visited there three times now.